Make sure you finish off your look with some awesome coloured contact lenses. These beautiful coloured contacts come in a wide range of designs which you will love pairing with your favourite accessories, makeup and outfits. Whether you’re going clubbing or shopping, these attention-grabbing lenses will turn heads all day long. Add a touch of glitter to your style with these fantastic glimmer contact lenses which will open up your eyes and light up your style. Everyone will fall in love with your sparkling lenses which will catch the light wonderfully. Below we have chosen three of our favourite lenses which will definitely grab everyone’s attention. These silver, gold and blue contacts have a life span of 1 year and 90 days once opened as well as a water content of 38%. Enjoy wearing our dazzling lenses to all your parties and special occasions. Your friends and family will be impressed with your quick transformation and beautiful glossy finish which will instantly pretty up your style. 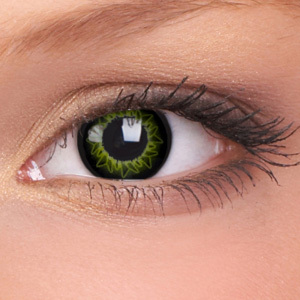 Make a bold statement in our fabulous and eye-catching starburst contact lenses. These fantastic ColourVue lenses will light up your look and impress all your family and friends. These incredible 90 day contact lenses with a water content of 38% will ensure you get comfort and style all in one. 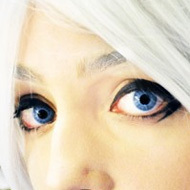 Below we have selected three black coloured contact lenses with a touch of blue, green and grey. They will cover up your natural eye colour and smarten up your style in an instant. Wear these to all your parties, days out and special occasions; everyone will love your gorgeous eye-defining lenses which will glitter with style, vibrant colour and girly glamour. This entry was posted in Contact Lenses and tagged color contact lenses, color contacts, color lenses, colour contact lens, colour contact lenses, colour contacts, Coloured Contact Lens, Coloured Contact Lenses, Coloured Contacts, Coloured Lenses, colourful glitter, colourvue, colourvue contact lenses, Contact Lens, contact lenses, Costume Contact Lenses on October 20, 2011 by Piercing Guru. Everyone wants a new look for summer and when it comes to contacts, you can’t beat a pair of blue contact lenses. Blue lenses really light up your face and they look really bright and fresh. They are also very flattering. A pair of blue contacts will brighten up the eye area and give you a lovely fresh-faced look. There are hundreds of different blue contact lenses out there but here are two of my absolute favourites. 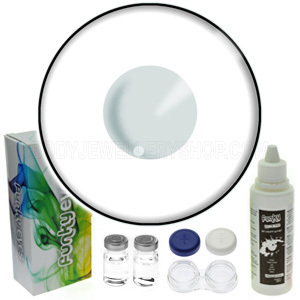 ColourVue Solar Blue Contact Lenses are a best-seller at Body Jewellery Shop and it’s easy to see why. These lenses have a beautiful colour that suits everyone, regardless of your natural eye colour, skin tone or make up look. 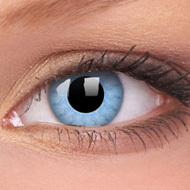 They have a vibrant blue with a lighter sunburst effect around the pupil. This sunburst makes them look really bright and luminous, as you can see in the second picture. Like all ColourVue lenses they are very comfortable and great quality. This entry was posted in Contact Lenses and tagged colour contact lens, colour contact lenses, colour contacts, Coloured Contact Lens, Coloured Contact Lenses, Coloured Contacts, Coloured Lenses, colourvue, colourvue contact lenses on May 16, 2011 by Piercing Guru. Get ready for the World Cup with our flag contact lenses. These amazing contact lenses feature all the different national flags and they are a great way to support your team. At BJS we have a great choice of flag contact lenses including the lenses here and many more. Flag contacts are comfy to wear and look awesome – plus they are also ideal for national holidays and fancy dress. Are Flag Contact Lenses Safe? Flag contact lenses are completely safe to use although as always it is important to wear and care for them correctly. 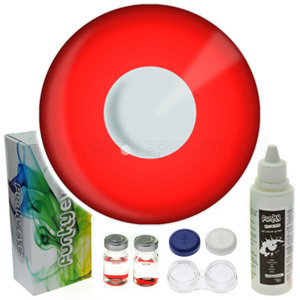 Make sure that you store your flag contacts in a clean contact lens case filled with contact lens solution. Contact lenses should only be worn for 8-10 hours at a time so itâ€™s a good idea to put them in just before you leave for the game. If you are going to be out longer than that I recommend taking your lens case and solution with you â€“ then you can take out your lenses later on and store them for the next round. When youâ€™re wearing contact lenses it is important to stay hydrated because if you are dehydrated your eyes can become dry and itchy. For this reason make sure you drink plenty of water when wearing your flag contact lenses and if you do experience any irritation remove your flag contacts immediately. This entry was posted in Contact Lenses and tagged colour contact lens, colour contact lenses, Coloured Contact Lens, Coloured Contact Lenses, Coloured Contacts, Coloured Lenses, Funky Contact Lens, Funky Contact Lenses, Funky Eye Contact Lenses, Funky Eyes on April 24, 2010 by Piercing Guru. Now you can get everything you need to wear coloured contact lenses with Colour Contact Lens Sets from Funky Eyes. These sets include a pair of lenses with a bottle of contact lens solution, a storage case and full instructions on how to wear your lenses. These contact lens sets are a great choice because you will need to buy solution and a case every time you buy a pair of lenses anyway â€“ you might already have solution at home but for hygiene reasons itâ€™s best to get a new case for each pair of lenses. Funky Eyes Contact Lens Sets are particularly good if this is your first time wearing contact lenses â€“ they give you everything you need to start wearing your contacts. This entry was posted in Contact Lenses, Gifts and Accessories and tagged colour contact lens, colour contact lenses, Coloured Contact Lenses, Contact Lens, contact lens care, contact lenses, gift sets, scary contact lenses on March 30, 2010 by Piercing Guru.